SALVAGED: To rescue, recover, reclaim and save from the (landfill) wreckage. 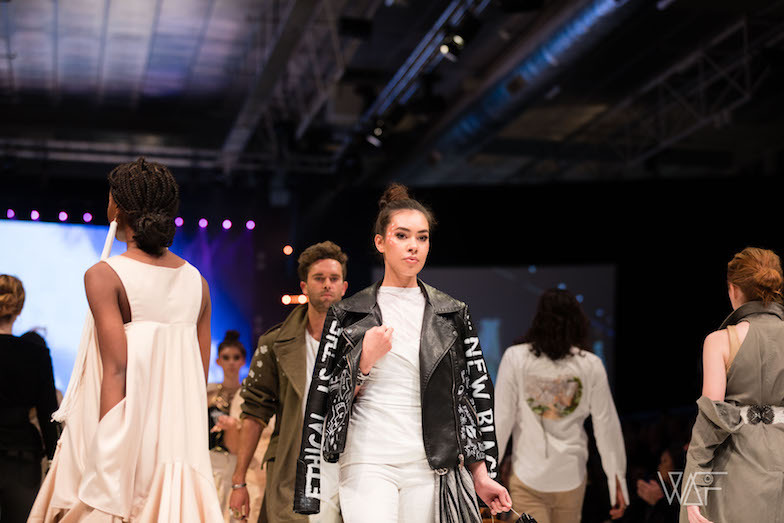 After 4 months of hard work I was so proud to present this up-cycled op shop collection from the core of my fashion heart with Salvos Stores for Fash Fest. 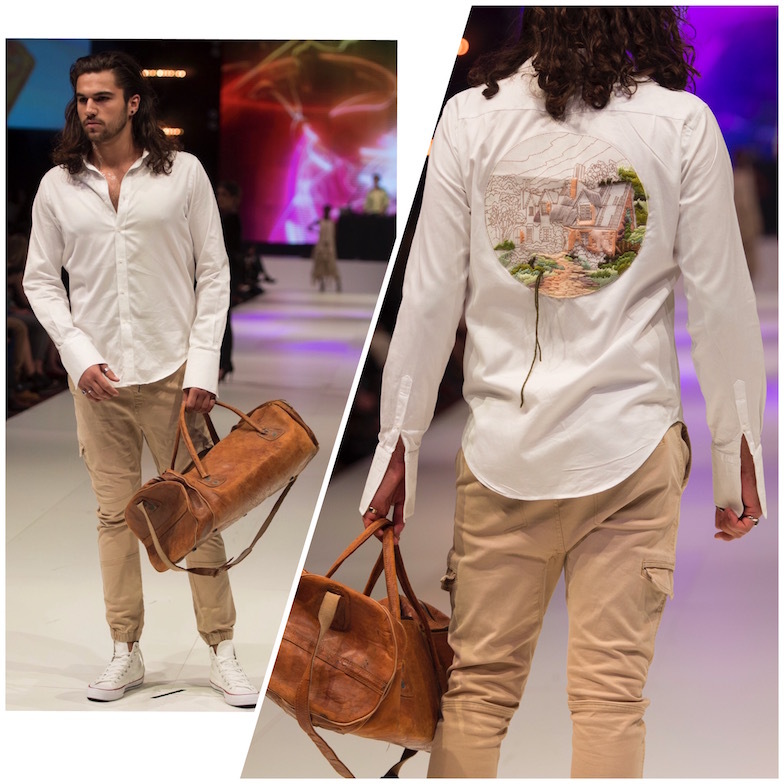 It’s fashion reinvention and serious eco chic, ‘Salvaged’ is sustainable style at its best. My vision was to illustrate just how high-end discarded and donated clothing can be. 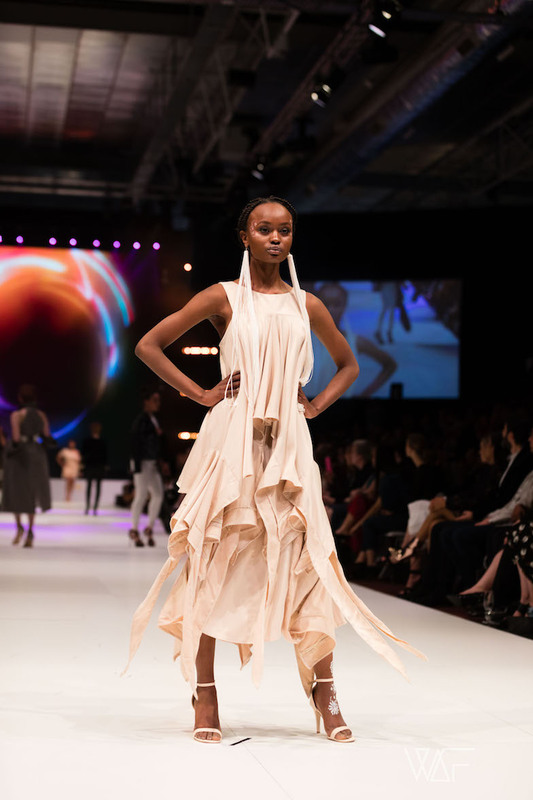 With the couture and designer runways as my guide I employed customisation, ingenious upcycling and even couture offerings from some of Australia’s most skilled designers and artists in the sustainable space. We wanted Salvaged to not only transform your perception of so-called ‘trash’, but to transform your perception of ‘second hand’. Cardboard Couture: My ode to Italian high fashion label Moschino. Two Salvos Stores trench coats and a vest were sliced up, reshaped and reconstructed to create this one of kind outfit. Jenny, one of the talented staff members at our Tempe Sydney store helped me bring this to life with her fantastic sewing and pattern making skills. Elements of actual cardboard from the Salvos warehouse were used throughout the ensemble including the little fascinator hat. Say hello to less waste! A Rich Tapestry: Inspired by Faye’s fathers 1970’s vintage jacket from Kings Road in London… A $10 unfinished tapestry found in the haberdashery section of the Salvos was added to a second hand Country Road white shirt to totally reinvent it. Teamed with caramel cargos and a vintage duffle bag – a great on trend look for the lads. Coat Tales : Maison Margiela creative director John Galliano is the king of clothing reinvention, not afraid to refashion garments like jackets into gowns or corsets. 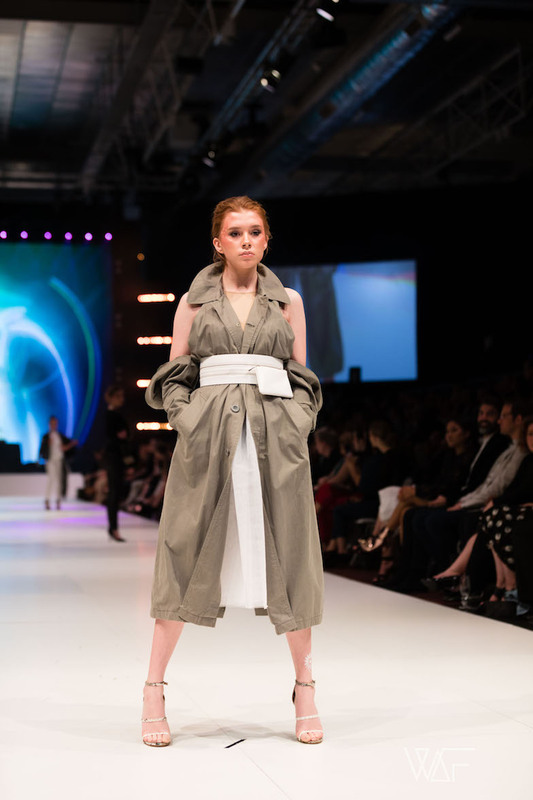 Inspired by their 2018 runway show in Paris, I deconstructed a vintage mens trench coat to create this offering of op shop couture in honour of the French House. The current ‘fanny pack’ trend was re-created using three $2 belts and a 50 c coin purse! Salvaged: I went to town on transforming second hand items into a completely new look to highlight the collections name sake. Soldier of Style: Sarah from One of a kind Denim strikes again with her stunning hand painted work on this 1966 army coat. I added in a customised white tee and distressed drop crotch denim to create a one of a kind look for the guys. Of Corset Is: I natural dyed an oversized mens bonds t-shirt with onion skins (yep onion skins!) and teamed it with this wonderful vintage Jenyns corset find from Queensland Hall all of Fame inductee Sarah Jenyn…google her, she was a total 18th Century Girl Boss! Green Goddess: Canberra based duo Eva and Mish from Vox Cor created this up cycled masterpiece from Salvos Stores finds. A jump suit, a blouse and beyond were reminded to reveal this eco fashion angel. Wedding Warrior: Lenka Couture is Australia’s first ethically accredited bridal couture designer, she is a master of mindful gowns.